Tea Gardens with its Myall river side dining and jetty's. 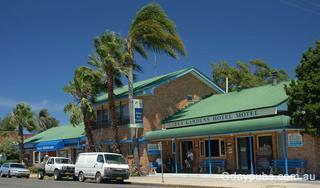 Located two hours north of Sydney and a few kilometres from the pristene waters of the Myall Lakes National Park. North side of Port Stephens and nearby to a 40klm beach with some areas 4wd friendly. Cross the bridge to Hawks Nest and Winda Woppa.